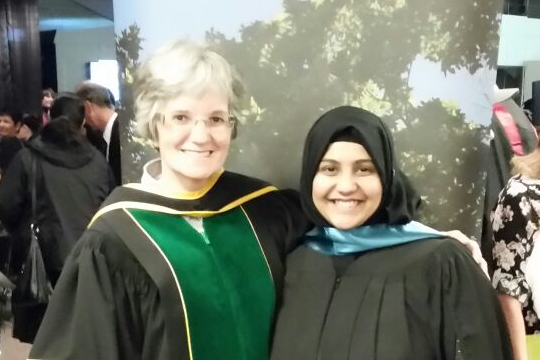 The College of Pharmacy and Nutrition is proud to announce that Saniya Alwani, one of our recent graduates who studied under the supervision of Dr. Ildiko Badea, has been awarded the University of Saskatchewan Master’s Thesis Award (Life Sciences) for 2015-2016. One Master’s Thesis Award is given annually in each of five disciplinary areas to recognize the most outstanding Master’s thesis by a University of Saskatchewan graduate in that area. Saniya's thesis outlines important foundational research into the use of functionalized nanodiamonds as therapeutic gene delivery agents—this award recognizes the significance and contributions of her Master’s research and thesis to both research at the University of Saskatchewan and the knowledge base of her field of study. Saniya began her studies with Dr. Badea in January 2013 after completing a Doctor of Pharmacy degree at the University of Karachi in her native Pakistan. She successfully defended her thesis, Amino Acid Functionalized Nanodiamonds As Gene Delivery Vectors, in September 2015 and graduated at Fall Convocation 2015. During her time in our program she earned both the Pharmacy and Nutrition Graduate Student Scholarship and a Graduate Teaching Fellowship, and was highlighted in the College of Pharmacy and Nutrition January 2015 Trainee Spotlight. She received an award for Best Research Presentation at the Western Canadian Medicinal Chemistry Workshop in 2014. Notably, Saniya was also awarded the Antoine A. Noujam Award of Excellence for her poster presentation at the 2014 Canadian Society for Pharmaceutical Sciences Annual Symposium, an award that recognizes the scientific merit, discovery, innovation, and contribution of the research being presented to the field. To date, Saniya has co-authored a patent, an invited textbook chapter, and a journal article as a result of her Master's research. After completing her MSc, Saniya has continued to work with Dr. Badea as a research associate. She has also been working towards licensure as a pharmacist in Canada, which she hopes to achieve by this August. She intends to continue her research in a PhD program in future and hopes to eventually hold an academic position that will allow her to continue pharmaceutical research.